The last academic year saw a unique collaboration between Sci-Tech Hermelin College, Netanya, and a Israeli company named Wize DSP. 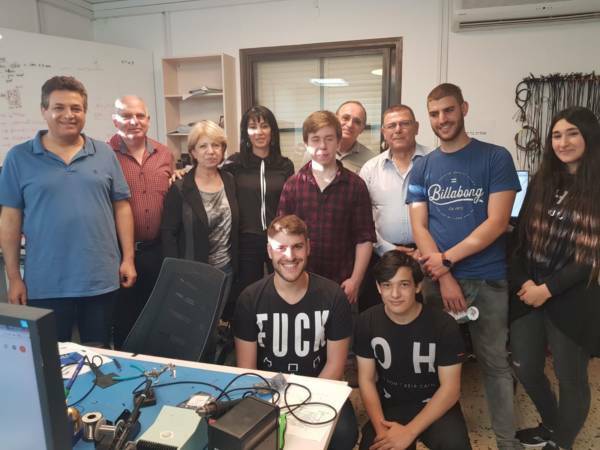 Five top students majoring in Mechatronics, as part of their pre-military programme for advanced technological studies, led by Ms. Faina Rosh, were granted access to the company’s advanced systems for their final project. For this final project, a joint development team was set up by the company and the college. The team included two senior engineers from Wize DSP and two instructors assigned by the college, as well as the five students, who worked together to develop a robotic system whose function is to monitor the production process of electronic circuits and cards. 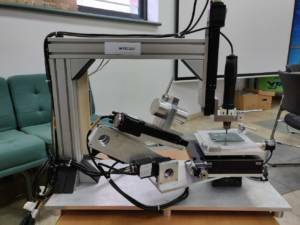 The system is built around a robot with three axes of control, which performs delicate welding jobs on the electronic cards during their production process. The development team had split into two sub-teams, each planning a different device for the overall system. One of the sub-teams designed a Cartesian robot equipped with a workbench for mounting an electronic card, while the other sub-team developed a manipulator robot which revolves around the workbench. During their work on the project, the students regularly visited the company’s facilities, and at the same time the company donated a model of the system, with an estimated value of some 50,000 NIS, to the college. This generous donation enabled the students to maintain their ongoing work in the college’s lab. The product developed through this project corresponds with the company’s line of business, so the students’ engagement with their instructors gave them a view up close of an actual development process in a real-life engineering team. Furthermore, the experience had a profound educational and empowering effect on the students. Mr. Oz Gabai. Director-General of Wize DSP, was very impressed by the students’ development work, their learning skills, and their creative ideas for solving various problems which arose during the project. The company expressed its willingness to expand the project to encompass more students during the 2018/19 academic year.